Lantern Candle, Black Metal Candle Lanterns Decorative Outdoor This black metal candle lantern decor highlights every pretty curve and cutout of this six-panel lantern; candle not included. 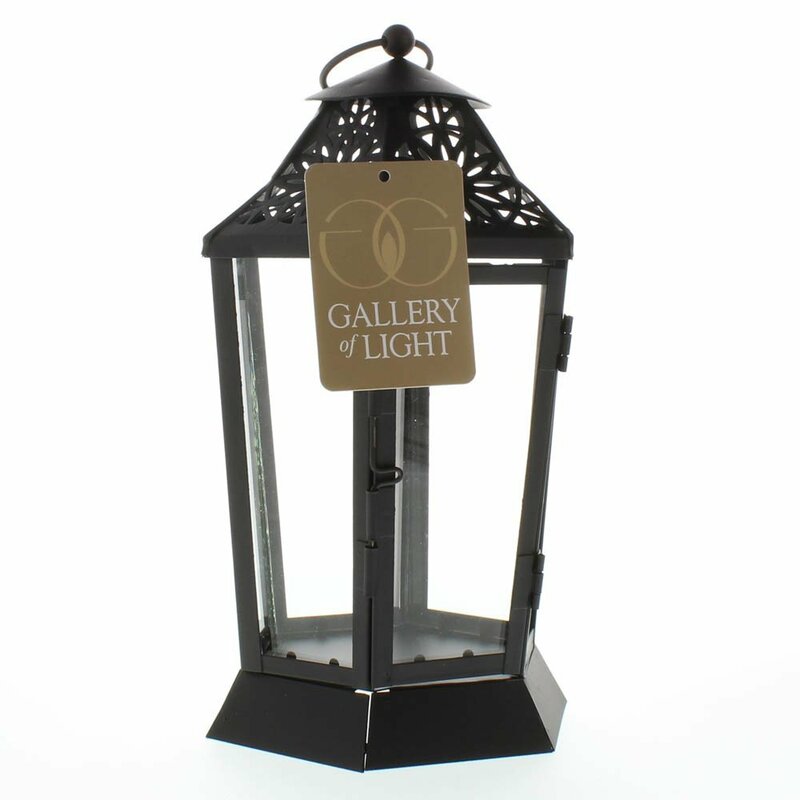 Utterly enchanting when filled with golden candlelight, this metal candle lanterns decorative is an attractive accent even during the day. 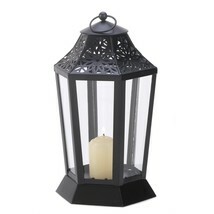 The black metal lantern candle holder is made from premium materials to serve you for years to come; create a truly unique experience you’ll appreciate. 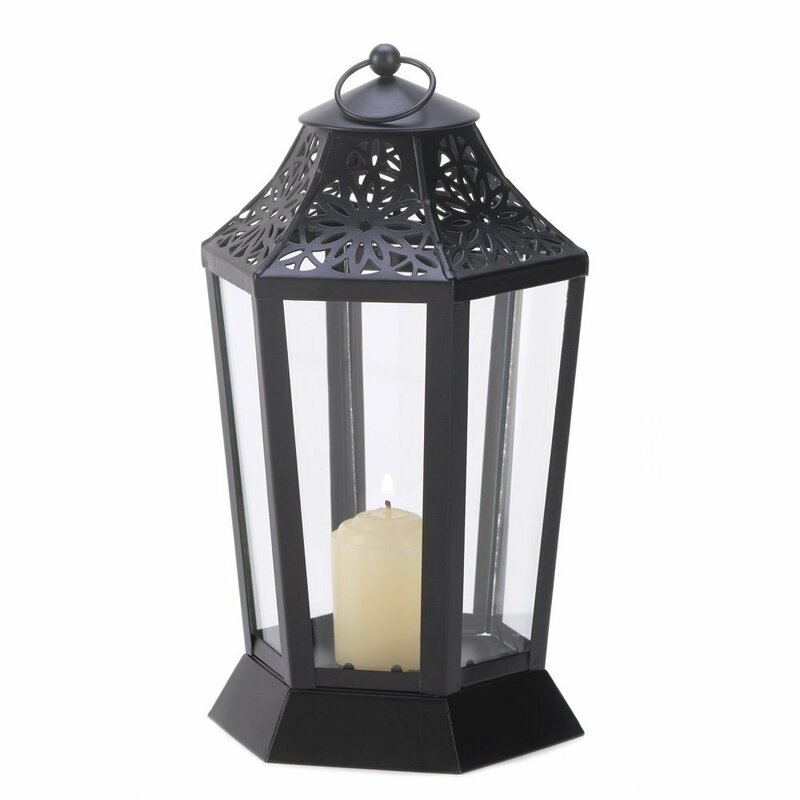 This black outdoor candle lantern holder is perfect for home decor, outdoor, fashion, or playtime uses; blends of exceptional quality and dependability. 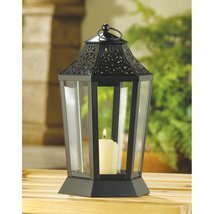 Dimension of this rustic candle lanterns black is: 5.75" x 5" x 9.75"; weight of this lantern candle outdoor is: 1.3 pounds. TypeCandle LanternBrandGallery of LightMaterialIron,Glass, AcrylicFeatures Hanging Tabletop ColorJet-BlackModel13930MpnDoes Not Apply PRODUCT DETAILS YOU MAY ALSO LIKE Candles Holders, Metal Candle Holder Stand, Tall R ... Candle Holder, Large Decorative Tall Vase Candle ... Sconce Candle, Indoor Decorative Modern Wall Sconc ... Sconce Candle, Indoor Decorative Modern Wall Sconc ... Iron Candleholder, Decorative Glass Candle Holder ... White Lantern Candle, Antique Decorative Iron Scro ... Candle Lantern Decor, Decorative Outdoor Copper Mi ... Metal Flower Candle Holder, Votive Small Candle Ho ... Flowers Candle Holders, Purple Colored Flower Meta ... Candle Holders Metal, Colored Candle Holder Decor ... SHIPPING POLICY All of our orders ship out within 1-2 business days after payment has been received. We use UPS Ground and USPS for most of our shipments. Buyer will receive invoice first which will show the item tracking number and carrier website where buyers can review package status. Lease refer to the listing details or message us if you have any specific questions regarding shipment. We only ship to the confirmed address, Please verify your address is correct before you pay for the item. Items are usually shipped 1-2 business days after payment has been received. We do not ship on weekends and holidays. Sellers are not responsible for service transit time. Transit times are provided by the carrier, exclude weekends and holidays, and may vary with package origin and destination, particularly during peak periods. International buyers are responsible for duties and customs fees. Tracking numbers will be sent to all customers upon package shipment We do not ship to P.O. Boxes, Military APO's or FPO addresses. We do not offer local pickup. We do not offer combine shipping. We are not responsible for any incorrect or undeliverable addre RETURN POLICY We offer a No-hassle 30 days replacement/refund after receiving your parcel. The merchandise must be returned in its original condition to us. The amount refunded will be the purchase price plus any additional shipping fees you paid (if any). Any returning must inform us first, to send back without return RMA# given by us will not be accepted. We might ask buyer to test the item in order to eliminate improper use factor, buyer has responsibility to follow the test correctly. We will cover all expense (Item price, Shipping) if confirmed due to manufacturing problem or our errors, the other way round, buyer will responsible for the return and ship to postage. The item must be returned in NEW condition and with the entire original package and accessories, manuals, etc or it will be rejected by our warehouse and returned back to you. Replacement/Refund will be made within 3-5 business days after the goods are returned and received by seller. We strongly recommend you to use a service with tracking# to locate the return packages. Items return after the required deadline we might ask for 10-20% restocking fee. Returned products are permitted and must be initiated by the buyer within 30 days from the date of purchase. There is no restocking fee for damaged or defective products. Shipping and handling fees are absolutely non-refundable. All non-defective, undamaged products are subject to a 20% restocking fee if returned opened or in a non-factory sealed box. Please, always contact us first, before starting a return via message system for an assistance. PAYMENT POLICY Credit Cards processed by PayPal Please keep in mind that eChecks through PayPal to be cleared by your bank before we can begin processing your order. Payment must be received within 10days after notification of total payment due. Unpaid auction wins will be forfeited and will be reported to. If you purchase multiple items, you can combine all eligible items into 1 invoice and make a single payment for all items. and the shipping rate will be adjusted during checkout.